Mobile Cart is sold as a kit with 1 monitor mount and 1 keyboard arm. Additional monitor arms & keyboard arms are available separately. LCD monitor, keyboard, mouse, and computer not included. Wouldn't it be great to have a portable computer with all the power of your desktop machine? Now you can... by making your desktop PC portable. 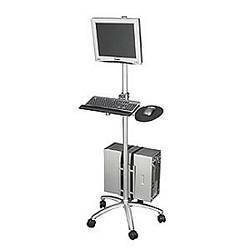 This ergonomic mobile computer workstation has a pivoting VESA standard mount for an LCD monitor, an adjustable keyboard tray/mouse platform and a sturdy CPU mount all on a 5-point rolling stand. Our industrial computer workstation is perfect for hospitals, clinics, schools and more.